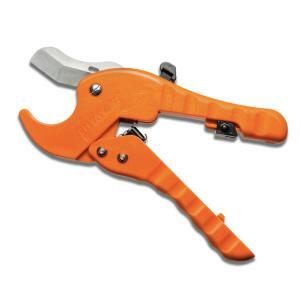 The KwikCut Ratchet Cutter is a double action ratchet that offers plenty of power when cutting heavy walled pipe. Cuts 1/8” to 1-5/8” OD PVC pipe. One-handed operation with a dual push button safety release and locking mechanism. This durable fiberglass reinforced nylon constructed cutter with precision milled blade is manufactured right here in the USA.